We’d love your help. Let us know what’s wrong with this preview of Biggles And The Little Green God by W.E. Johns. 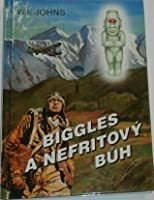 Biggles tentokrát vyšetřuje záhadné zmizení malého nefritového bůžka. 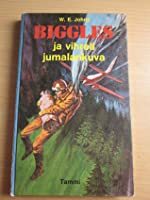 Biggles se ujímá případu zmizení letadla s nákladem vzácného nefritového bůžka Atu-Hua. Bůžek má jediné oko z rubínu neobvyklých rozměrů, a proto je jeho cena vysoká. Celý případ je samozřejmě velice spletitý, Biggles ovšem jako vždy přijde nakonec celé věci na kloub. To ask other readers questions about Biggles And The Little Green God, please sign up. Invariably known as Captain W.E. Johns, William Earl Johns was born in Bengeo, Hertfordshire, England. He was the son of Richard Eastman Johns, a tailor, and Elizabeth Johns (née Earl), the daughter of a master butcher. He had a younger brother, Russell Ernest Johns, who was born on 24 October 1895. He went to Hertford Grammar School where he was no great scholar but he did develop into a crack sh Invariably known as Captain W.E. Johns, William Earl Johns was born in Bengeo, Hertfordshire, England. He was the son of Richard Eastman Johns, a tailor, and Elizabeth Johns (née Earl), the daughter of a master butcher. He had a younger brother, Russell Ernest Johns, who was born on 24 October 1895. He went to Hertford Grammar School where he was no great scholar but he did develop into a crack shot with a rifle. This fired his early ambition to be a soldier. He also attended evening classes at the local art school. In the summer of 1907 he was apprenticed to a county municipal surveyor where he remained for four years and then in 1912 he became a sanitary inspector in Swaffham, Norfolk. Soon after taking up this appointment, his father died of tuberculosis at the age of 47. On 6 October 1914 he married Maude Penelope Hunt (1882–1961), the daughter of the Reverend John Hunt, the vicar at Little Dunham in Norfolk. The couple had one son, William Earl Carmichael Johns, who was born in March 1916. With war looming he joined the Territorial Army as a Private in the King's Own Royal Regiment (Norfolk Yeomanry), a cavalry regiment. In August 1914 his regiment was mobilised and was in training and on home defence duties until September 1915 when they received embarkation orders for duty overseas. He fought at Gallipoli and in the Suez Canal area and, after moving to the Machine gun Corps, he took part in the spring offensive in Salonika in April 1917. He contracted malaria and whilst in hospital he put in for a transfer to the Royal Flying Corps and on 26 September 1917, he was given a temporary commission as a Second Lieutenant and posted back to England to learn to fly, which he did at No. 1 School of Aeronautics at Reading, where he was taught by a Captain Ashton.